حسینی, مهدی, دسروس, ژاکوس. (1387). طراحی و ساخت دستگاه آزمایشگاهی برای تعیین نفوذپذیری شعاعی سنگها همراه با تغییرات تنش مؤثر. نشریه انجمن زمین شناسی مهندسی ایران, 1(1), 71-82. مهدی حسینی; ژاکوس دسروس. "طراحی و ساخت دستگاه آزمایشگاهی برای تعیین نفوذپذیری شعاعی سنگها همراه با تغییرات تنش مؤثر". نشریه انجمن زمین شناسی مهندسی ایران, 1, 1, 1387, 71-82. حسینی, مهدی, دسروس, ژاکوس. (1387). 'طراحی و ساخت دستگاه آزمایشگاهی برای تعیین نفوذپذیری شعاعی سنگها همراه با تغییرات تنش مؤثر', نشریه انجمن زمین شناسی مهندسی ایران, 1(1), pp. 71-82. حسینی, مهدی, دسروس, ژاکوس. طراحی و ساخت دستگاه آزمایشگاهی برای تعیین نفوذپذیری شعاعی سنگها همراه با تغییرات تنش مؤثر. نشریه انجمن زمین شناسی مهندسی ایران, 1387; 1(1): 71-82. الف) آزمایش تحت فشار جانبی (محصور کننده) افزایشی و فشار منفذی خارجی (فشار در محیط نمونه r=re) ثابت. ب ) آزمایش تحت فشار جانبی ثابت و فشار منفذی خارجی افزایشی. این پژوهش بر روی یک ماده متخلخل مصنوعی که CPIR09 نامیده می‌شود انجام شده است. فرم شکست نمونه­ها به صورت یک جفت صفحه شکست شعاعی می باشد. نتایج آزمایش نشان می‌دهد هنگامی که فشار منفذی خارجی ثابت است با افزایش فشار جانبی مقدار نفوذپذیری شعاعی سنگها کاهش می‌یابد. در حالتی که فشار جانبی ثابت ولی فشار منفذی خارجی افزایش می‌یابد، مقدار نفوذپذیری شعاعی اندکی افزایش می‌یابد. افزایش فشار منفذی باعث می‌شود، موادی (خرده سنگ) که در داخل ناحیه شکست وجود دارد، شسته شده و ناحیه مربوطه خالی شود و در نتیجه، نفوذپذیری به میزان قابل ملاحظه‌ای افزایش یابد. 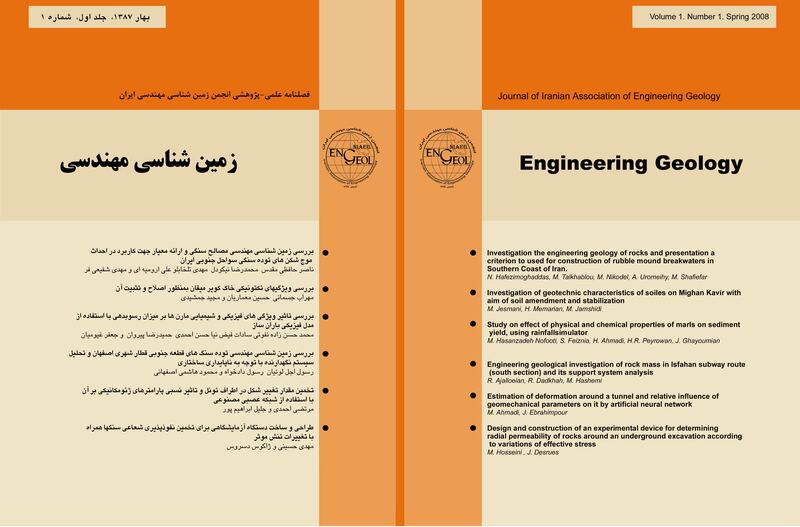 This paper describes an experimental device which is used for determining radial permeability of rocks around well bore hole according to effective stress. Permeability of rocks is a very important characteristic because it controls the flow of fluid. Laboratory tests on thick-walled hollow cylinders of rock are relatively easy, economical and realistic means to understand better the mechanisms associated with wellbore failure. The tests were carried out on a very porous artificial material (CPIR09). The mode of rupture observed in the tests was a pair of radial rupture planes. The results obtained show that when the external pore pressure is constant the global permeability decreases with increasing external pressure. When the external pore pressure increases the convergent radial flow of pore fluid (due to the imposed pore pressure) slightly increased the global permeability samples. The convergent radial flow of pore fluid acts to remove fractured materials and to erode localization bands, therefore, the global permeability samples brutally increased. Chen X., Tan C.P., Wu B., Haberfield C.M. (1998) Modelling of the undrained behaviour of wellbores, The geotechnics of hard soils-soft rocks, Balkema Rotterdam. Ewy R.T., Cook N.G.W. (1990) Deformation and fracture around cylindrical opening in rock, Int. J. Rock Mech. Sci. & Geomech., Vol. 27, 387-417. Haimson B., Lee H. (2004) Borehole breakout and compaction bands in two high porosity sandstones, Int. J. Rock Mech. Sci. & Geomech., Vol. 41, 287- 301. Hosseini, M. (2005); Etude expérimentale du comportement hydro-mécanique d’une roche poreuse en relation avec les problèmes d’excavation, Ph.D. Thesis, Univ. Grenoble 1. Papamichos E., VardoulakisI., Tronovll J., Skjaerstein A. (2001) Volumetric sand production model and experiment, Int. J. Num. & Analy. Methods in Geomech., Vol. 25, 789-808 .